A delightful slow cooker vegan stew with lots of great flavors. Use the Recipe-by-Photo Index Page for Soup or Stew to see all the slow cooker stew recipes that have been featured on this site. It only takes one look at the recipe for this Squash and Carrot Stew from Kitchen Parade to see how flavorful this dish must be with spices like paprika, coriander, cumin, turmeric, and ginger as well as a bit of Thai curry paste. Imagine those flavors cooked in the crockpot with carrots, butternut squash, canned tomatoes, and lemon juice, and then finished by chopped fresh cilantro and mint. This recipe is vegan, unless you can’t resist adding a spoonful of Greek yogurt or sour cream. 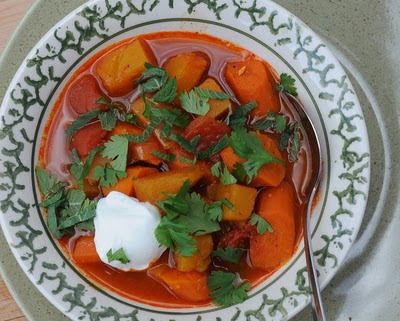 Get the complete recipe for Squash and Carrot Stew from Kitchen Parade. Use the Recipe-by-Photo Index Page for Soup or Stew to see all the slow cooker stew recipes that have been featured on this site.